Don't be fooled by the Timber Hawk Backstrap's modest size, it has plenty of room to fit all of the essentials including bulky items like lightweight rain gear. All pockets are lined with an ultra-quiet durable twill fabric to protect your gear and keep it quiet. 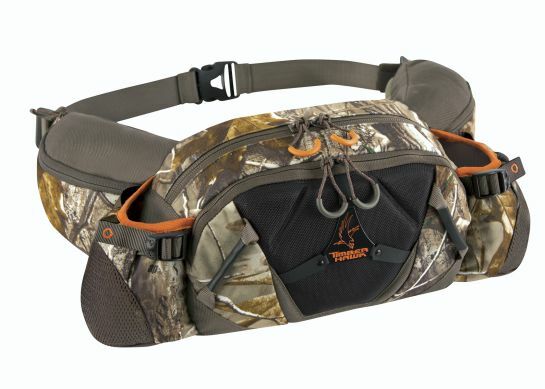 The main compartment is flanked by accessory pockets featuring large loop zipper pulls which are ideal for smaller items that need to be accessed in a hurry such as game calls, lures, flashlights or ammo. Secured between the hip belt pockets and the main compartment are dual mesh water bottle holders, which easily accommodate two over-sized water bottles, or you can get creative and use these pockets to stash hats, gloves or a face mask. The pocket backs and waist belt are constructed using high-density breathable foam padding for enhanced comfort in any weather condition or equipment load. The waist belt is fully adjustable with left and right compression straps to balance your load and customize the fit. Need to carry more gear? You can always enhance the Timber Hawk Backstrap's function and capabilities by lashing even more gear to the webbed accessory loops.